Look how excited I am about our workshop! 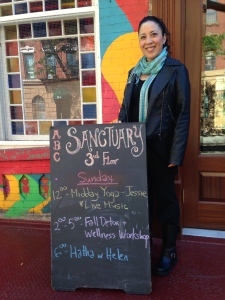 This past Sunday, on October 5, 2014, Chia-Ti Chiu, of One Love Wellness, and I collaborated on a Fall Detox-themed wellness workshop – to heal and release what no longer serves us, so that we can welcome the Fall harvest. Chia-Ti and I go a ways back. 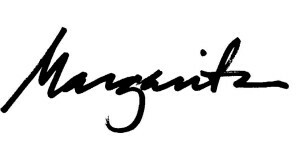 I was editrix and publisher of my independently published magazine (otherwise known as a ‘zine), Bamboo Girl, which coincidentally garnered packed fundraiser events, that featured established and up-and-coming artists and activists at the time. And, Chia-Ti was (and still is) a poet extraordinnaire. Flash forward to our work now in the healing arts. Not such a coincidental thing, since many people I knew who were activists and community builders, back in the day, are now teachers or healers. So, when Chia-Ti and I reconnected, and she said, “Hey, would you like to collaborate on a workshop together?”, I was more than game! Participants filled our space at Alphabet City Sanctuary on Sunday, and we had a full house! 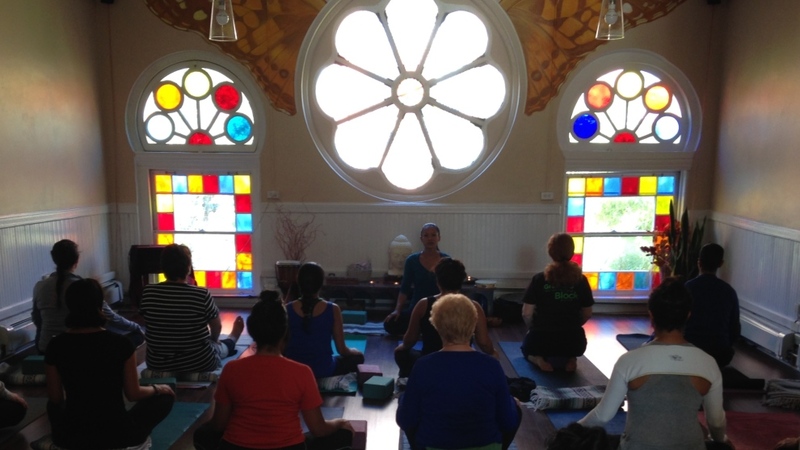 The stained glass windows brought such an air of sacredness to the space, and the energy in the room was full of readiness to get in touch with the self, on many levels. Me serving up some Acu-love. After Chia-Ti and I introduced ourselves, and our offerings for the day, Chia-Ti led participants through a Yoga sequence to open their bodies to release what no longer serves them. What a treat that I got to enjoy yoga alongside a few of my patients! 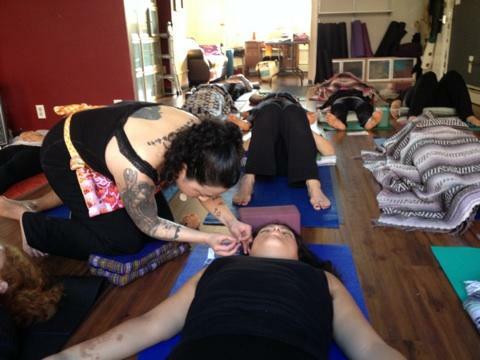 I followed by performing an Acupuncture ear treatment, called the NADA protocol, as participants rested in savasana. After administering the NADA technique, I held space for everyone in the room by performing group Reiki. Likely due to the group dynamic, as well as the fact that the space often holds yoga/meditation/sound healing workshops of various kinds, it was especially easy for me to “plug in” to the energy grid. It was powerful! And, I could feel the vibration raise in the room. I always know that when I feel that, I know others can, too. Participants enjoyed my gigantic jug of Reiki-infused water that I brought to the event (it was gone by the end of the workshop)! For some time now, I’ve been creating custom essential oil blends and sprays for my patients, depending on their needs. My new Space Clearing Spray product line. 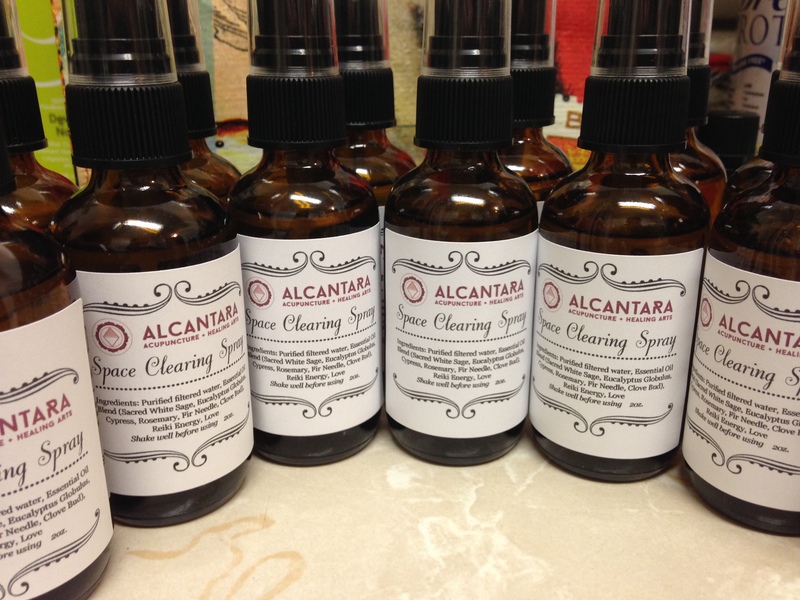 But, for the first time, I’ve created a line of my Space Clearing Spray – a powerful energy-clearing spritzer made of various energy-clearing essential oils, in a blend made with love, and infused with Reiki energy. I placed them in brown apothecary-style spray bottles, and I enjoyed sharing with participants how to use them. I love making them so much, as well as sharing them, that I’m inspired to create a product line of essential oil blends and sprays, starting with the Space Clearing Spray! So, if you’d like to grab one for yourself, to clear the energy in your home or office, drop me a line! Chia-Ti and I also left everyone with a small token to bring home, a Reiki-blessed crystal, to help them facilitate their detox at home. I may have created and co-facilitated many workshops in the past, as well as a few Acupuncture clinics, but this was my first collaborative effort in creating a comprehensive wellness experience. And, it was a blast! Suffice to say, there will be more to come in the future. So, what can you do at home to usher out what no longer serves you, and welcome the Fall Harvest, on what will be a powerful Full Moon Eclipse tomorrow morning? Release through ritual. Write a list of those things from your past that have been weighing heavily on your heart, that you’d like to let go of. When you’re ready to surrender them to the Universe, safely burn it in a fireproof tray or container. For those of us in apartment dwellings in the city, make sure you do it near a window, too, so as not to set off your smoke alarm! Personally, I have my own mini cauldron that I like to use for these purposes. Take a salt bath. Yes, here I go again with the salt bath! Epsom salt soaks are so luxurious, but are also extremely purposeful. They help the body detox from physical strain, as well as oncoming colds. The magnesium component of the epsom salt helps with this effect. And, because most of the population is deficient in magnesium, it’s a nice way to get your daily dose, as well. It is conducive to relaxation, and will help you get to sleep that night. When you add a cup of baking soda to at least a cup of epsom salt, that’s a recipe for ultimate detox! Mix in a few drops into the batch before dumping it into the tub water, and you’re set for a treat that not only feels luxurious, but also cleanses your aura (particularly helpful after dealing with toxic people). Say hello to citrine. Citrine is one of the few crystals that never need to be cleansed, since it doesn’t hold and accumulate negative energy, but dissipates and transmutes it. It’s a “happy” stone, that clears the aura and aligns the auric body with the physical structure, diminishing the “muddy” areas in both the aura and physical body. It balances the yin/yang energy (how perfect for the merging of the masculine and feminine energies that is happening in the body and collective levels at this time), and aligns the chakras with the ethereal plane. It is also is called the “merchant’s stone”, since it assists the merchant in acquiring, as well as maintaining, the state of wealth. Place one in your cash box and see if it helps increase your income! As you can see, this stone has numerous uses, and one that we could totally use during the Fall detoxing in our lives. Unfriend your enemies. Whether it be on social media, or outside of it, it really doesn’t serve you to keep relationships that bring you down or make you believe the illusion that you need to be in pain, emotionally, mentally, physically, or otherwise. We are here on Earth School to learn our lessons, which can be impactful and intense enough! Make your life easier and release those relationships that don’t serve you anymore. Receive healing treatments. Whatever modality you love – Acupuncture, Reiki, Massage, etc. – take advantage of the self-love of a treatment. Not only will it help you recalibrate yourself on various levels, but you will be able to get more present and grounded by doing so. Healing treatments help you on the detox tip, since it courses your physical and energy bodies with your own healing energy (yes, we all have it within ourselves). And releasing what we’re holding in our bodies becomes very helpful when you want to make room to bring the good stuff in! What is your favorite way to release old patterns, to welcome in your true harvest?